"Thanksgiving Turkey" Oil on Gallery Wrapped Canvas 2" x 3"
I often receive requests to offer another turkey painting in the auction. What better time to put one out than Thanksgiving? Of course, turkeys may not agree. This is a weekly auction with the deadline being 5 pm EST Monday, November 22. Join Sharon and me 5 pm Friday night, November 5 for our champagne celebration. We will pop the corks on a few bottles of the bubbly and ring in our new year. If you havn't been to the gallery yet here is your chance to party and see all our new paintings, giclee reproductions and holiday gift items. I even have a few of the "White House Christmas Ornaments" on display. We are just one block south of Ocala's Historic Square, on the south side of Bank of America. I have received requests asking me to offer my weekly auction with miniature paintings during the holidays. So, here is the first painting put on the auction block. 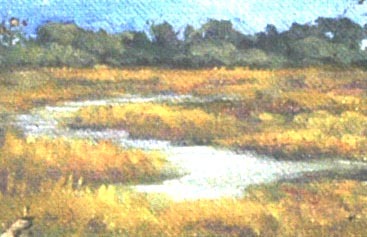 "Waterway" was inspired by a visit to the InterCoastal Waterway. The twisting and turning of fingers of water snake their way in all directions. 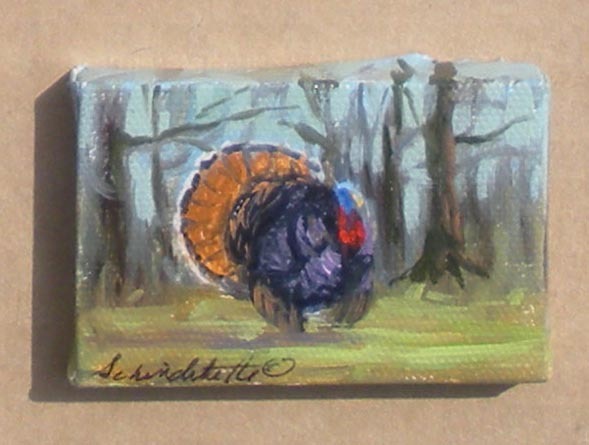 These little paintings make great gifts!